The panoramic view of the mountains is phenomenal. 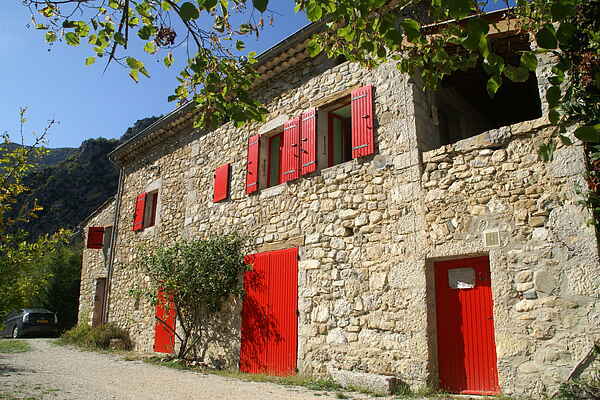 You can truly enjoy yourself in this holiday home near Cornillon-sur-l'Oule (2 km). The large garden (consisting of different levels) with lots of shade, a basket ball and soccer field, swing set, and adjacent river you can swim in, make this house into a real paradise. Via stone steps to the side of the house and veranda you enter the simply furnished house (ground floor is not in use). The picturesque Cornillon-sur-l'Oule, with impressive ruins of the twelfth century château, dominates the Oule valley. The extraordinary location, on 550 meters altitude, provides you with pleasantly cool evenings during the warm summer months. In La Motte-Chalancon (3 km) you'll find a swimming pool and restaurants. Besides beautiful walks you can also explore the mountainous area by car. On your way, be sure to visit villages like Rémuzat (7 km) and Verclause (17 km). The medieval city Nyons (35 km), where you can stroll along the "Promenade des Anglais", offers a beautiful view of the city. Naturally you'll also find delicious food and drink here. Die (49 km) also makes for a nice day trip. Your children will love the Jardin des Decouvertes, with exotic birds. NB: The last 500m to the house are an unpaved road, unsuitable for sports cars.